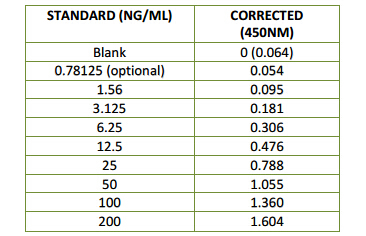 This Human Soluble Sortilin (sSortilin) ELISA Kit contains the necessary components required for the quantitative measurement of recombinant and/or natural human soluble Sortilin (sSortilin) from cell culture supernates and tissue homogenates, serum and plasma in a sandwich ELISA format. Unopened Kit: Store at 2 – 8° C for up to 8 months. For longer storage, unopened Standard, Positive Control and Detection Antibody Concentrate should be stored at -20° C or -70° C. Do not use kit past expiration date. Opened / Reconstituted Reagents: Reconstituted Standard (stock) solution and Detection Antibody concentrated solution SHOULD BE STORED at -20°C or -70° C for up to one month. Streptavidin-HRP Conjugate 100-fold concentrated solution and TMB Substrate Solution can be stored at 2 – 8° C for up to 8 months (DO NOT FREEZE and PROTECT FROM LIGHT). All other components may be stored at 2 –8° C for up to 8 months. Microplate Wells: Return unused strips to the plastic pouch with the desiccant pack. Microplate may be stored for up to 6 months at 2 – 8° C after opening. The minimum detectable dose (MDD) of sSortilin was 300 pg/mL. Sortilin is a protein that in humans is encoded by the SORT1 gene. The SORT1 locus shows the strongest association with serum lipoproteins of any genetic locus in the genome. In hepatocytes, sortilin participates in the presecretory degradation of nascent VLDL particles. This gene encodes a protein that is a multi-ligand type-1 receptor with similarity to the yeast carboxypeptidase Y sorting receptor Vps10 protein. The encoded protein, a trans-Golgi network (TGN) transmembrane protein, binds a number of unrelated ligands that participate in a wide range of cellular processes; however, it lacks the typical features of a signalling receptor. In the TGN,furin mediates the activation of the mature binding form. The encoded protein consists of a large luminal domain, a single transmembrane segment and short C-terminal cytoplasmic tail. The luminal domain contains a cysteine-rich region similar to two corresponding segments in the yeast Vps10p; the cytoplasmic tail is similar to the corresponding segment of the cationindependent mannose 6-phosphate receptor and the tail also interacts with the VHS domains of GGA (Golgi-associated, gamma-adaptin homologous, ARF-interacting) proteins. In melanocytic cells SORT1 gene expression may be regulated by MITF. Have you cited DEIA7080 in a publication? Let us know and earn a reward for your research.